Geography Quiz 1.0 is puzzle & word games software developed by Justgames.ch. The Geography Quiz invites you to test your knowledge of countries and landscapes around the world. This may be a tough one for those who are not so well-informed about the map of the world. Most of the questions revolve around locations of cities and countries, but there are some questions about population and great monuments as well. Each round consists of 10 questions and if you answer at least 7 of them correctly, you can proceed. This games & entertainment program is freeware, so you can download and use it absolutely free. 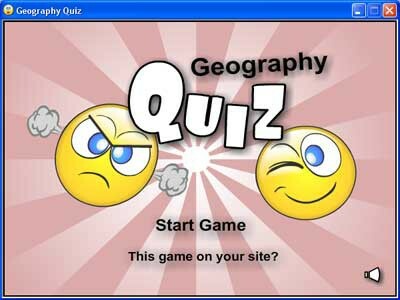 Geography Quiz 1.0 supports English interface languages and works with Windows 98/XP/Vista. Latest Geography Quiz 1.0 does not contain any spyware and/or advertise modules, allowing installing it with no worries concerning valuable information loss. We has completely tested puzzle & word games software Geography Quiz 1.0 many times, written and published the interesting article and uploaded installation file (2032K) to our fast server. Downloading Geography Quiz 1.0 will take minute if you use fast ADSL connection. World of Where is the easiest way to learn the countries and capital cities of the world on Mac OS X. Country Locator is a 3-D globe which helps one learn the countries of the world. Master European geography! Includes study mode and two test modes.